So for this wall I took the scan and did a is mix of vectoring and painting..but the painty side shows more.. ><'' I wanted to keep it nice and simple and sketchy looking because I felt it would fit the scan better. The bg was a vector, but then I went over it with a simple hard round brush adding in the sketchy look and other details. Ah, the funnest part was adding in the bubbles in the bathtub and making the rubber ducky :P oo.. and of course I had to use my extreme texture abusing skills to finish it off. Me and my texture abusing self need help lol! For the widescreen go here.. Proposed by Saikusa and highlighted by kuroimisa. The water colour textures are great! What a beautiful crafted background! You've treated the scan with real grace, and applied that same style to the whole background. It's wonderful! oh, i love your wall! :) Thanks so much! I think it will be my fav wall for a long time. Love the simplicity and the soft pastels. Nice work on paint job and the slight texture gives a nice blend. I love your variation on this. The background blends in so well with the scan, it's amazing how well you did that! :D Keep it up! weird..in filipino soap is sabon. This is so cute! I love the soft colors! It is simple and soothing. I love it! Good job ! reminds me of MoMusu's single. I like the simplicity and the clean concep! oh i remember this from one of the endings it has in..? i love nodame cantabile! 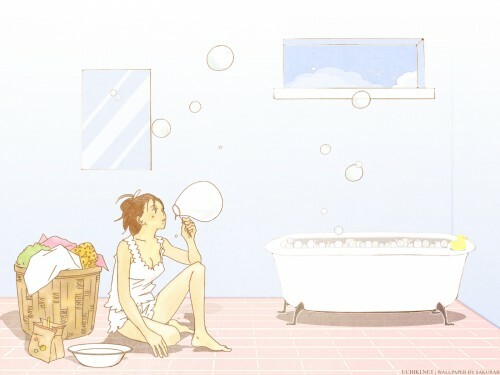 and i love your wall..
nodame so cute ! Love this wall =w= . Thanx for uploading !